The mileage logbook will be written automatically. 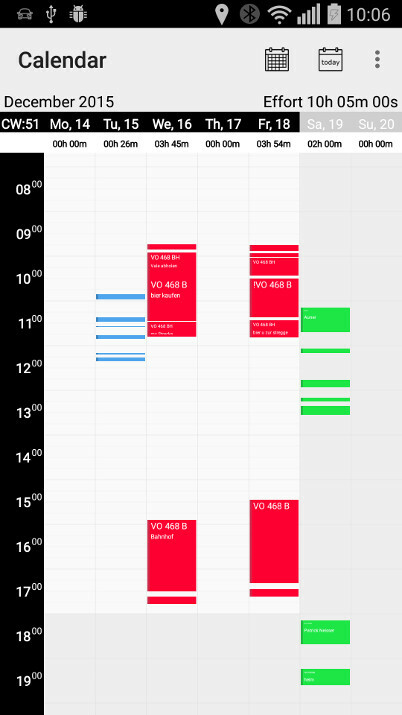 Just check it in the afternoon. There was no compromise in development! 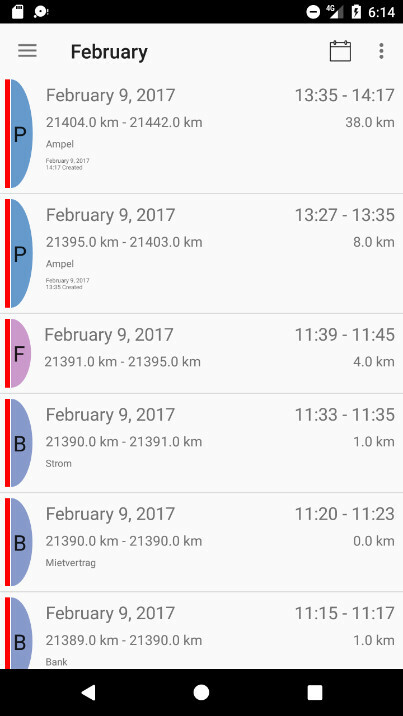 TripTracker is a native Android App. TripTracker does not spy. The data is your property and will not be forwarded to anyone!! TripTracker provides complete and correct data collection. 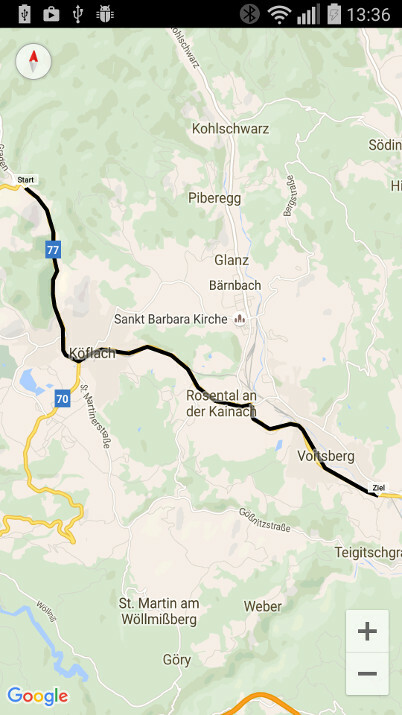 The integrity of your mileage logbook is ensured by various hash and encryption algorithm. Each entry has its own checksum to guarantee that it isn't changed afterwards or outside of TripTracker. Also the generated PDF can be signed by one of our servers to ensure that it can't be modified. 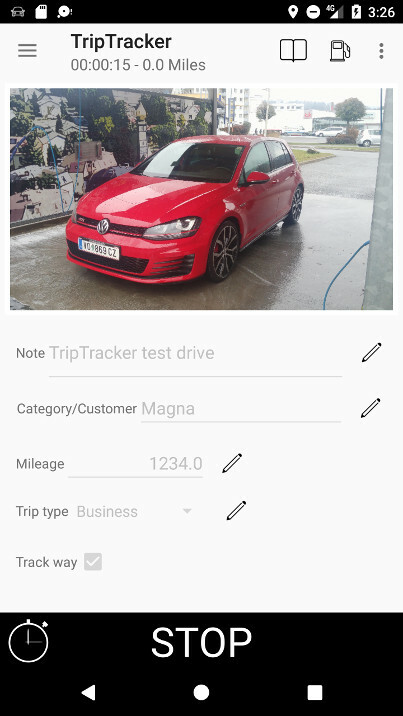 With TripTracker you have better chances that your data will be accepted as with the handwritten mileage logbook since in case of any doubts you could provide the tracked GPS-Coordinates or, if you use the OBDII-Plugin, even the data out of your car’s engine control unit to prove your trips. However, it depends on you and how you use TripTracker. 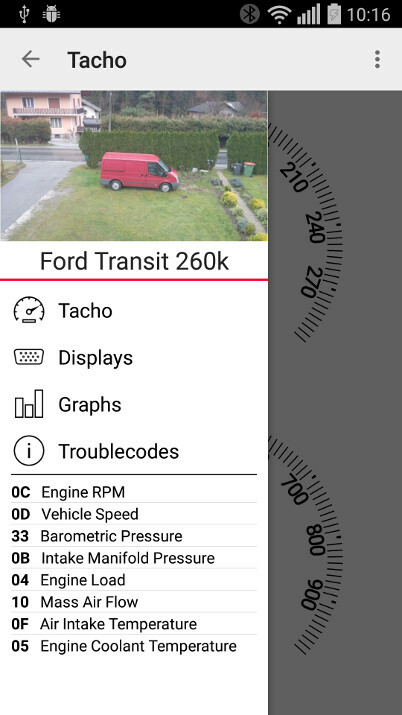 TripTracker is able to connect directly to your car so that it can read the odometer and calculate the distance traveled. 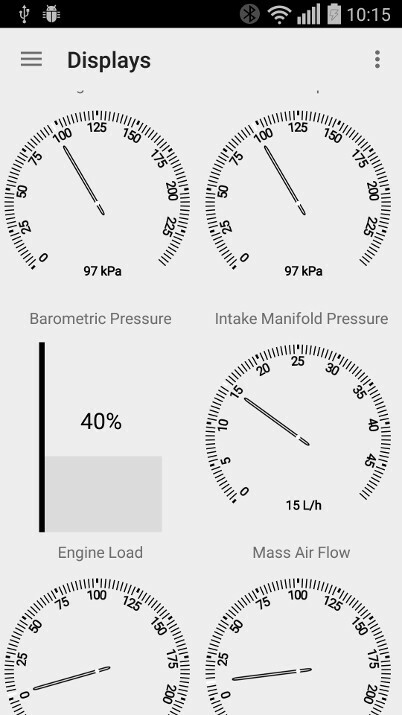 In addition various parameters and the troublecodes can be displayed. 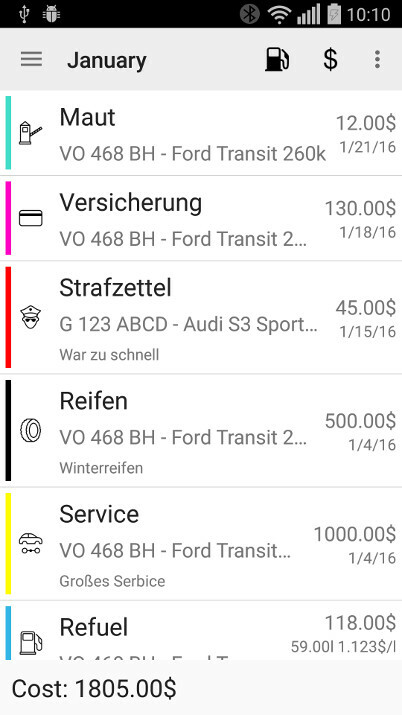 To use this feature you don’t need to modify your car! You just require a Bluetooth adapter which is plugged in to the cars OBDII interface. Installation is very easy since in most modern cars the OBDII interface is directly beneath the steering wheel. Please note: Most cheap OBDII-Adapters on the market don't perform good over a longer period. 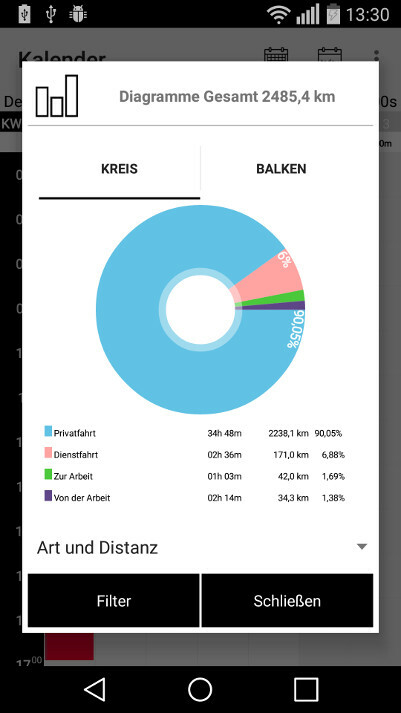 Thats the reason why an optimized version especially for TripTracker was developed. Privacy: Your data is owned by you! In contrary to most other systems all the collected data of you mileage logbook is owned by you. It is not stored somewhere abroad on a Server or a Cloud. The data is on your phone in a local high performance SQL database. TripTracker does not sell or analyze your data (like all social media companies do)!! TripTracker has a powerful synchronization mechanism that allows you to collect and edit your data across multiple devices. 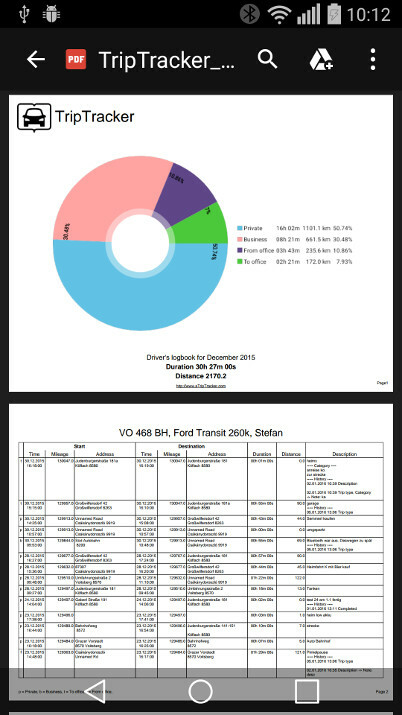 There is also a web interface which allows you to analyze your mileage logbook on a PC or Mac. You can register a account on the top right side of this website. Are you looking for a time tracking solution? TripTracker has a brother called TimeTracker which is suitable for everyone who needs a full functional time tracking solution. We would be pleased to receive a message from you but maybe you will find the answer to your question already in the Frequenlty asked questions? Another great resource is the manual which can be found here. There you find illustrated setup instructions for allmost any feature of TripTracker. As a little thanks for your effort you will get one unlock code for one feature of your choice. You have a suggestion for improvement? If it is a usefull feedback you will get one unlock code for one feature of your choice.